The Istanbul Archaeology Museums are housed in three buildings; the Museum of Archeology, the Tiled Kiosk Museum, and the Ancient Orient Museum. Combined they make up one of the world’s biggest museums, containing more than 1 million historical artifacts from various cultures and civilizations. The museums are located in the outer gardens of the Topkapi Palace. The founder, Osman Hamdi Bey, started the construction of the Istanbul Archaeology Museums in 1881, in an attempt to stop the export of Ottoman Empire treasures. The museums have an extensive collection of treasures from the Middle East and Turkey spanning a time period of around 5000 years. The artifacts, historical elements and antiquities are grouped thematically in the museum. In 1883, Osman Hamdi Bey commissioned the Museum of the Ancient Orient as a fine arts school. Later it was reorganized as a museum and opened for public viewing in 1935. In 1472, Sultan Mehmed II commissioned the Tiled Kiosk, which is one of the oldest structures in Istanbul that features Ottoman civil architecture. The museum houses more than a million objects, many of which are extraordinary. The most popular collections are the Sarcophagi which are dated back as far as the fourth century BC. It also has a huge collection of local artifacts that shed light on the history and origin of the city. 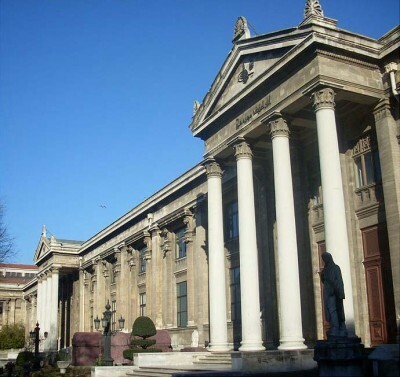 The main Archaeological building of the museum was built in a neoclassical style and contains a wide collection of artifacts, historical elements and antiquities of turkey. There are more than 80,000 Ottoman coins, medals and decorations. The lion statue found near the entrance was obtained from one the seven wonders of the ancient world, the mausoleum of Halicarnassus. It was saved from British architects and preserved in the museum safely. The collection of sarcophagi found to the left in the hall represents the various architectural styles that were influenced by Lycia, Phoenicia, and Egypt. Other famous sarcophagi include the Alexander Sarcophagus and the sarcophagus of the crying woman. The various displays of this museum include the 14th century bell from the Galata Tower, recovered snake’s head from the Serpentine Column, troy exhibits, sculptures of Palestine, Syria, and Cyprus and the display on the evolution of Anatolia over the centuries. The Museum of the Ancient Orient has a wide collection of artifacts from the ancient civilizations of the Arab continent, Anatolia, Egypt, and Mesopotamia. There is also a museum for the children and a large model of the Trojan horse.